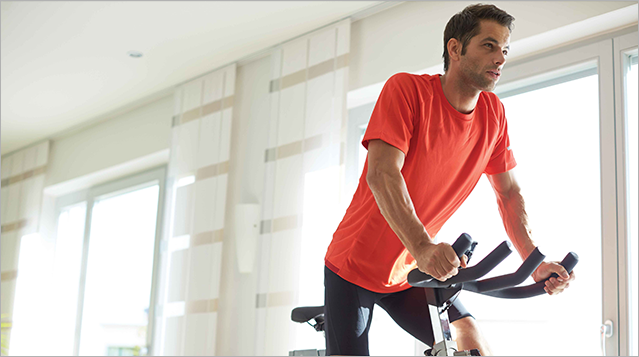 Putting some thought into how you'll use your exercise bike will ensure you're happy with your purchase. Asking yourself a few questions will help you decide on the best placement and schedule for you. When are you more likely to use your exercise bike? Morning exercisers tend to be the most successful in sticking to their workouts (fewer distractions at that time of day! ), but a good workout schedule is the one that works for you and your family. Will you need extra entertainment? Consider speakers and audio inputs if you want to listen to your own music while you ride. If you are going to watch TV while you ride, be sure you’ll have a clear view of the screen. You may want an extra set of speakers. Do you want to be in the middle of family activities or will biking be a time for you to be alone? Placing your bike in the bedroom might work great if you'll be using it mid-morning, but not so great if you need to sweat before your partner is out of bed. Maybe even consider an unusual placement, such as an unused corner of the kitchen or dining room, if you want to be closer to your family. You might be able to exercise while the kids do homework or your spouse prepares dinner, and you won’t miss any of the family check-ins and conversations. What features are you likely to use? While you may find yourself simply sitting down and getting started for the first few workouts, you'll want an exercise bike that will stick with you. A variety of workouts will help you to avoid the dreaded fitness plateau, while heart rate monitoring lets you train smarter for better results in less time. You can even keep yourself motivated with your favorite music. Take a look at programming options even if you don’t plan to use them right away.